**Free mid-size car while cars are available. Not valid with any other special offers. Car can be upgraded for minimal fee, unlimited mileage and taxes included, and is picked-up and dropped-off at the airport. Cars are on a 24-hour basis so if flight arrival and departure times exceed the number of days reserved, there will be an additional charge. This newly refurbished and well-appointed one-bedroom bungalow is the perfect host for a laid-back island adventure with your ohana, located just a short 10-minute walk to fun in the sun at Poipu’s beaches. With two living areas distributed across the two-story guesthouse, everyone can spread out and do their own vacation thing. While the kids play card games on the tropical ground floor lanai, the adults can enjoy a cold drink with an ocean view upstairs. Come together for family movie night on the flat-screen TV with a DVD player (DVDs provided), or stream your favorite show on your device using the free WiFi. The intimate kitchen and dining areas make thoughtful use of their compact space, with a cozy breakfast nook for five offering peeks of ocean views, and a fully equipped kitchen ready to whip up any meal. And with a gas grill on the lower lanai, family BBQ night is a must. At bedtime, sleep up to five in a queen-size bedroom with an en suite bath, a twin-size bed in the attached sleeping area, and an upgraded queen-size futon in the living room that's surprisingly comfortable. A queen Murphy bed is also downstairs. Proximity to Fun: Snorkeling, whale watching, beachside sunsets, and lanai dining at Brenneke’s or Poipu Beach are just a few of many attractions within a 10-15 minute walk from this home-away-from-home. Ohana-Friendly: With sleeping arrangements for five, two full baths, an in-house washer and dryer, two living areas, and a spacious lanai, this exceptional one-bedroom retreat is a great (and affordable) option for a small family traveling together. Adventure Perks: Get out and explore more of the "Garden Isle" with a free midsize car rental included in the price of the guesthouse! Located in Poipu at the end of a cul-de-sac in a quiet residential neighborhood, you and your ohana will enjoy total peace and privacy while being within close reach of Poipu’s many recreational activities. From whale watching at Makahuena Point and paddle boarding on award-winning Poipu Beach, to playing a round of 18 at Kiahuna Golf Course and taking in Hawaii’s extraordinary beauty by zipline, kayak, or even a helicopter tour, there’s truly something for everyone on Kauai’s sunny south shore. Perfect size for one or 2 couples. Kitchen well stocked with all amenities, and a quick and easy walk to the beach. No neighbors the first few nights, so it was very quiet. When we had neighbors the last few nights we wouldnt have even known they were there other than the cars in the driveway. Peekaboo ocean view from the kitchen. We had a great time and the location is perfect! Centrally located in the quiet resort area of Poipu. sparkling clean bungalow, well stocked kitchen, private parking. Did not hear anything from houses next door and slept very well. Bed in master was super comfy. This is a nice place that's located near Poipu Beach, a hot spot for snorkeling, amazing sunsets, and sea turtles. My friends and I had plenty of space, and it was always nice to come home and relax after a big day of adventuring. Lots of good amenities, and comfortable places to spend time together. The only thing I would comment on is the lack of AC. We knew going in that there wasn't a unit in the house, but the house retained a lot of heat to the point where it was cooler to be outside. All the team members we talked with were very helpful and nice! Very good customer service! The property was great. The only drawback was the lower bedroom was very hot and there was no airflow. We did not spend a lot of time in the bungalow as there were so much to do on the island so it all worked out. Everyone we interacted with was very friendly and responsive. The house was a getaway in paradise! We thoroughly enjoyed our stay and were delighted that the pictures on the website depicted the house exactly! We very much liked this bungalow- so much better in real life than the photos- there was a full or queen futon that was comfortable (however no blinds for AM sun-not an issue for our guest), another single bed in a room, and a queen bed with own bedroom and en suite downstairs. Also couch and tv downstairs. Though not listed, theres a closet with body boards and water noodle. Washer dryer downstairs that works well- includes Tide Pods! Upstairs was the kitchen, full bathroom, couch, tv, hanging bed, and tons of seating areas. Windows almost all the way around. Grill and patio furniture out front. LOVELY welcome kit and we felt the online resources were great. You could walk to beach, but really driving is better- parking was so easy and the best beaches on the island 3-4 mins away. 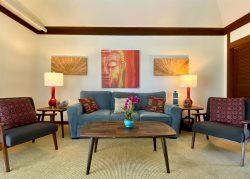 Nearby Koloa is great and location is near tons of good restaurants, shopping, rental places. Could not have been happier having the rental car included Wed definitively come back, next time hopefully well avoid an impending hurricane! Nice location and good management. Place needs updates and AC to justify the price, especially if you are staying in the summer. This is a perfect little gem in a great location. Close to everything in Poipu and easy access to the main highway. Neighbors were kind and helpful as well. Excellent place to stay! We rented this property and the one next to it for our family and friends for our wedding week in Kauai. We had an amazing stay and will be back again! Linda was very nice. Repair work on broken screen done quickly! Great space, especially for a small group who dont need a ton of privacy. Very clean and great location. This house is great for groups of friends. We traveled with 5 and had the perfect amount of space. Located very close to beaches and fun things to do! The rental car really sealed the deal for us. We even were able to snag a free upgrade to an suv once at the airport. If you look sad enough when trying to load 5 people and 2 weeks worth of luggage into a rather crammed car, Alamo will help ya out. This place was a pleasant surprise! Cute bungalow and neat set up. The free rental car was an amazing bonus and the price wasn't too bad considering we were in Kauai. The quick and easy booking and checking in and out were a breeze. Would definitely stay here again. After a awful experience with another host Molly mo we were saved by this amazing place! We were so refreshed to find this clean bug free house that was adorable,affordable and had amazing views. The check in process was so easy especially since it was last minute. She responded so quick and made everything so easy. It had everything we needed and was so spacious and cute! Thanks so much for the amazing stay you saved us!!! This was the most perfect house for our family. It felt homey and so clean. We were able to cook every night and save some money. It's roomy with a separate bedroom and multiple beds for all the kids. Two bathrooms was convenient as well. Close to lots of cool places and walking distance to the beach. Only thing we missed was having a beach umbrella, which was provided in previous place. Overall this was our favorite place so far. Even though it was close to the neighbors, everyone was polite and quiet. Definitely hope to come back and stay here again. This sweet bungalow was perfect for our little family and a few friends! Smart use of space makes plenty of sleeping room for everyone without feeling crowded. The open floor plan around the kitchen meant we all got to hang out together over breakfast and dinner with beautiful views of the ocean and surrounding trees. The loft bed was such a cool feature, and we loved being able to walk to the beach. A great place in Poipu! A 15 minute walk to Poipu beach and great boogie boarding at Brennecke's beach. Quick drive to Baby Beach. Easy booking and easy pick up at Alamo. Our kids loved the "treehouse". It was like having a playground inside the house! The major cons are lack of air conditioning and close proximity to other houses, so it can be loud at times. The house next door is also a vacation rental property. A lovely place to stay in an exceptional setting. Lots of room, beds and sofa beds to sleep. kitchen has equipments so we can cook like we are at home.